The Vancouver bustle never ceases to amaze me. Even the recent housing inferno and business boom these past few years are mere echoes of a vibrant and distinct past that few cities in the world can compete with. By 2031, Vancouver will be home to one million more people with 500,000 more jobs. A groundbreaking number for a city developing much faster than some residents would like to admit. And while provincial efforts have been made to cool off development projects for the sake of identity, one can’t help but reminisce to back when Vancouver traffic was bearable and our trip to the corner store would cost around 20 cents. Already, there are dozens of photos available that highlight the city’s growth these last few decades. The pictures are oddly fascinating as Vancouverites ponder what life must have been like for early contemporaries. This post is going to take it a step further. We’ve dug up old photos of Vancouver pre 1920 to highlight what Vancouver was like 100 years ago today. You’ve heard the saying, Some pictures are worth 1000 words. Well we think these ones are worth 1000 more. 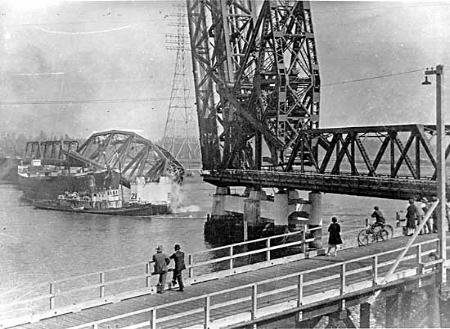 Vancouver has had a turbulent past with it's bridges. And this was before the 5 o'clock traffic headache. The picture recounts the infamous Second Narrows crash caused by a collision and is one of the 2 pictures in this post that happened after 1920. Back before you could rent bycicles or feed the friendly raccoons. Stanley Park was a swamp that was smartly transformed into one of the most iconic sights in the city. It's funny how the old Granville street looks much more inviting, but you still had the occasional jaywalker. I'll give you a hint, it rhymes with "gram calorie"
How about another, it's the most popular place in Vancouver during April 20th. This is the front of the Vancouver Art Gallery. 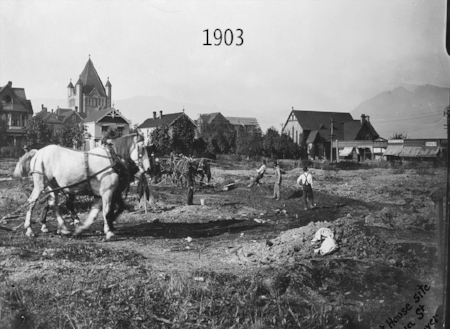 The horses were ploughing the land in preparation for the building. Before you start squinting at what you are swing, yes that is the Vancouver skyline back in 1937. The viewpoint is from none other than North Vancouver's Lonsdale Quay. The viewpoint is still there of course, but I seabus takes a little longer than 15 minutes. As always, let us know your thoughts in the comments bellow and don’t forget to come by Vancouver’s original Ox Lounge located at 1180 Howe street.